The Calcasieu Parish Sheriff’s Office is investigating a hit and run that took place on Sunday, May 6 at approximately 11:30 p.m. at the Golden Nugget Casino located at 2550 Golden Nugget Boulevard in Lake Charles. 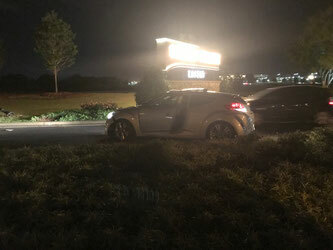 During the investigation, it was learned that the driver of a Hyundai Veloster hit a light pole and knocked it to the ground near the traffic circle. The Veloster is described as a late 2 door model that is equipped with a sunroof and is white or silver in color. The car will have damage to the front grill as well as a detached front bumper on the driver’s side. The Calcasieu Parish Sheriff’s Office is asking the public for assistance. If anyone recognizes the car in this photograph or has any information about this incident, please call the lead investigator, Sgt. Bryan Guth at 491-3846 and reference case number 18-55173.